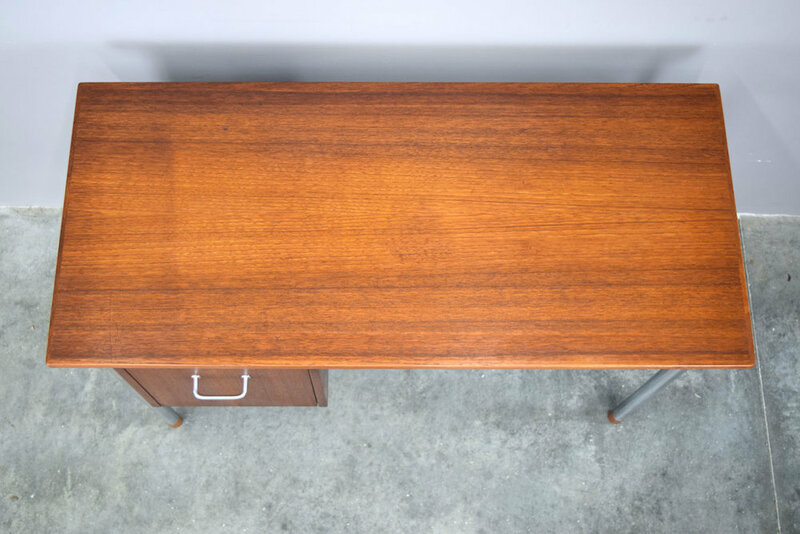 This is a classic Danish teak writing desk after Arne Vodder. It’s so lovely and versatile! 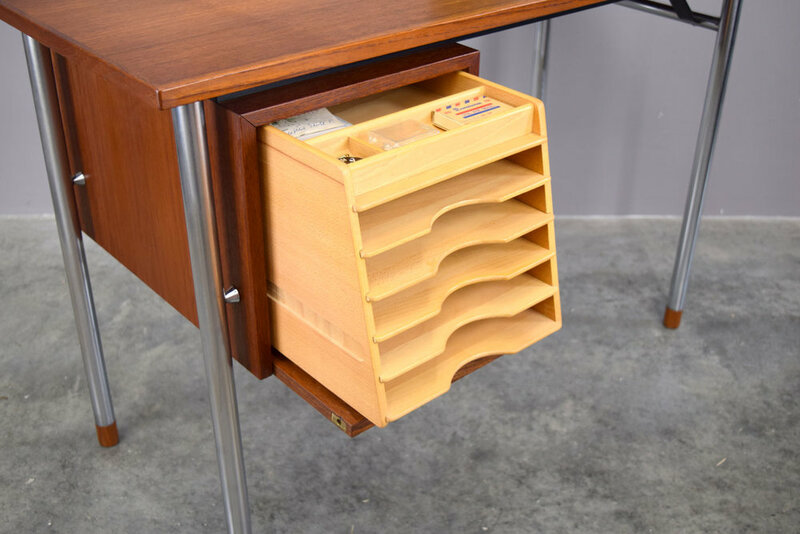 The drawer bank can be slid either left or right, and the hinged leaf allows more work space when needed. 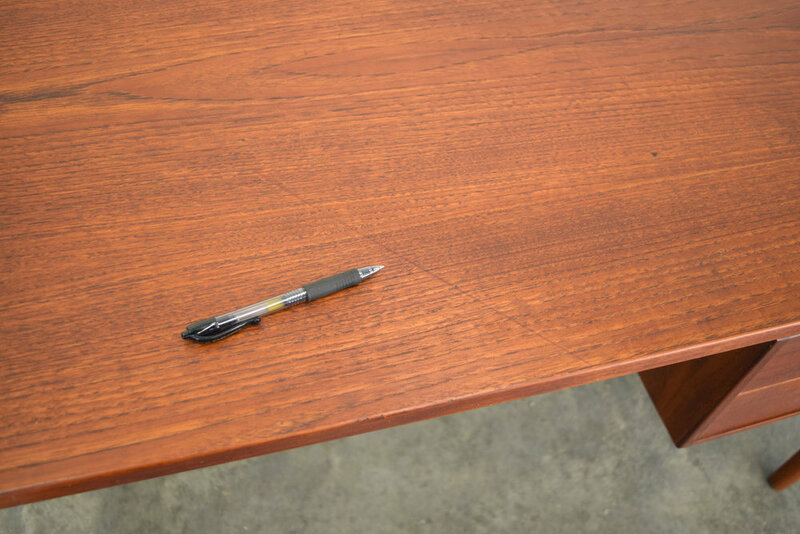 This particular piece is of a higher quality that the more ubiquitous later production similar desks you typically see. This piece is also finished on the back, so it can be placed anywhere in the room! In very good vintage condition with age-appropriate wear. There are a few tiny specks of white paint and some dings and scratches as shown. 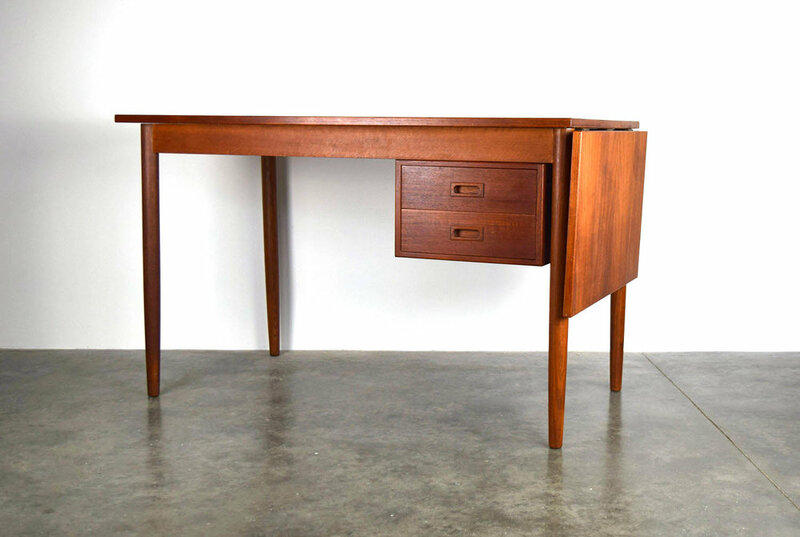 A stunning Danish executive desk, circa 1960. Designed by J. Svenstrup for Andreas Pedersen Møbelfabrik. This example is executed in stunning Brazilian rosewood. 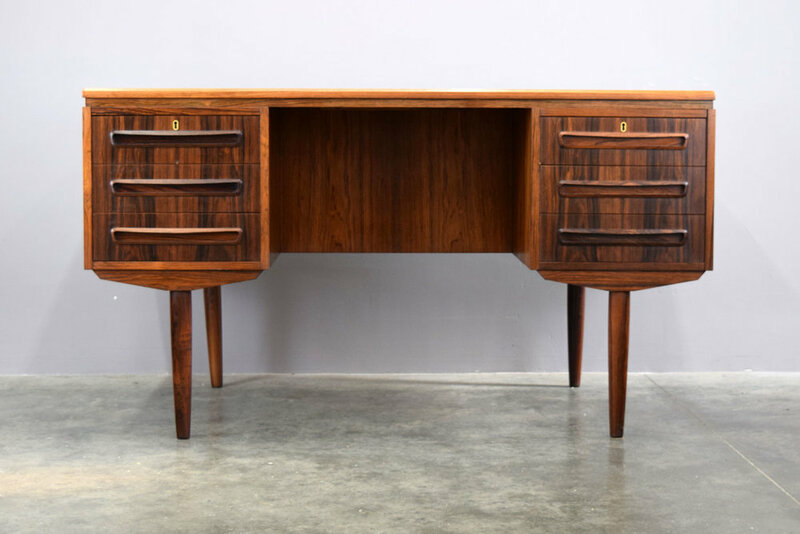 It has wonderful details like the wide carved pulls, top edge detail, and solid rosewood tapered legs, and is fully finished on the back with display cubbies and a drop-down bar or storage cabinet. 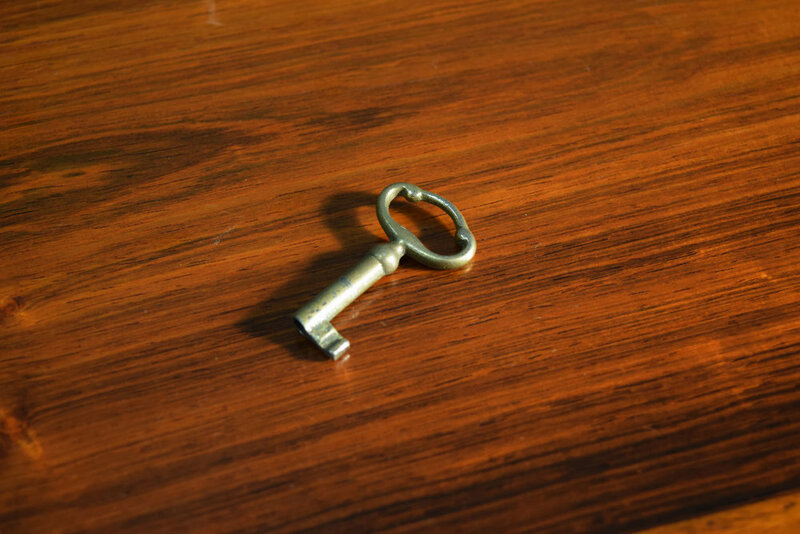 We even have the original key! 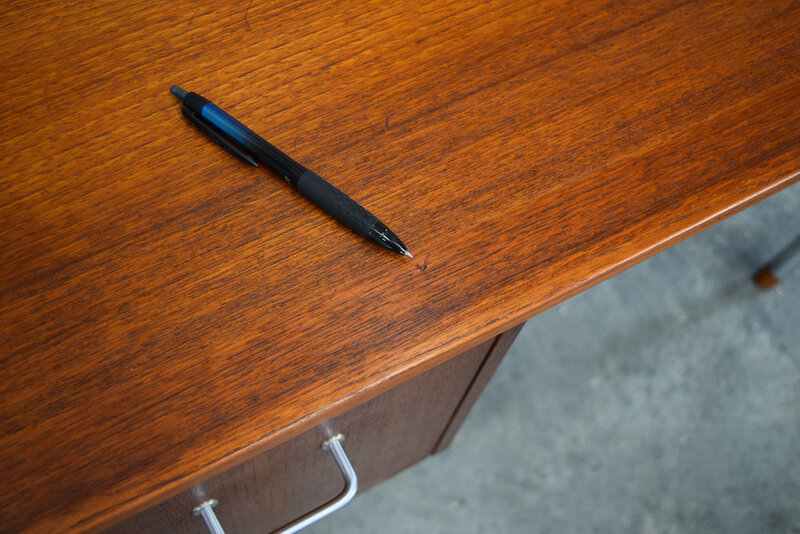 This desk is in very good vintage condition. The top has some very light scratches, a darker area where a blotter blocked the sun (will even out over time) and a couple of spots where the lacquer finish is slightly duller. The left side has four small filled holes, barely noticeable. The top left drawer has a chip, top right has a tiny corner chip, and the knee space has a couple of small chips. All drawers slide smoothly. This is a truly special little desk. 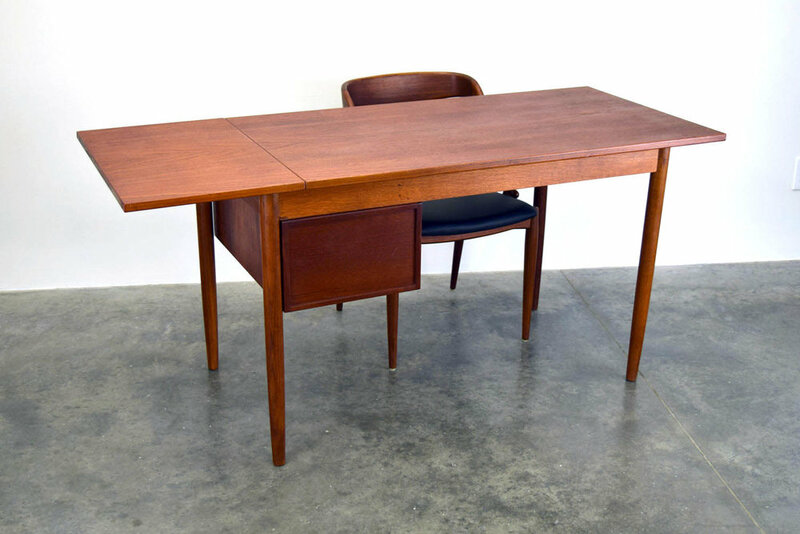 Very rare single pedestal desk designed by Aksel Bender Madsen and Ejner Larsen in 1959 and manufactured by Næstved Møbelfabrik, Denmark. In gorgeously patina'd teak with chromed steel legs atop teak feet. The details are just wonderful and it is very well-made. It is finished on the back for placement anywhere in the room. This petite beauty features a drop-down door with clever slide out paper shelving unit. Each tray has an adjustable guard at the back to customize depth for various sized papers. Top section is divided for pens and small item storage. This piece is in excellent vintage condition with age-appropriate light wear. 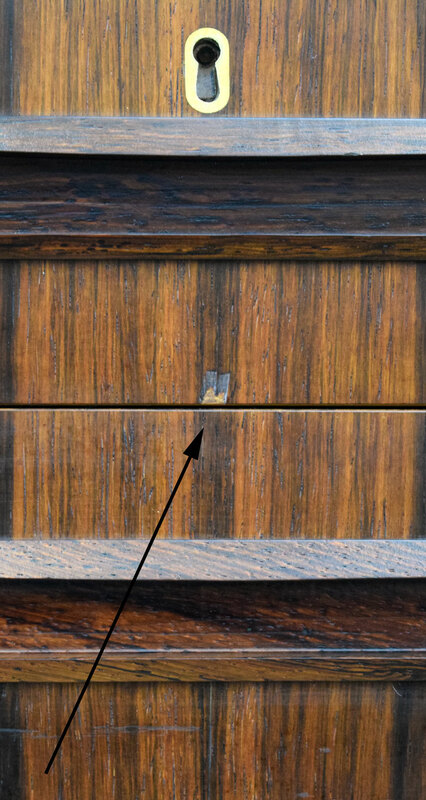 The cabinet has a tiny chip on the corner and tiny chip on bottom edge of the door. The top has a slightly more faded area from being covered up by something; this should even out over time. There are a few light scratches as shown. Subscribe to receive notification when we post new collections. 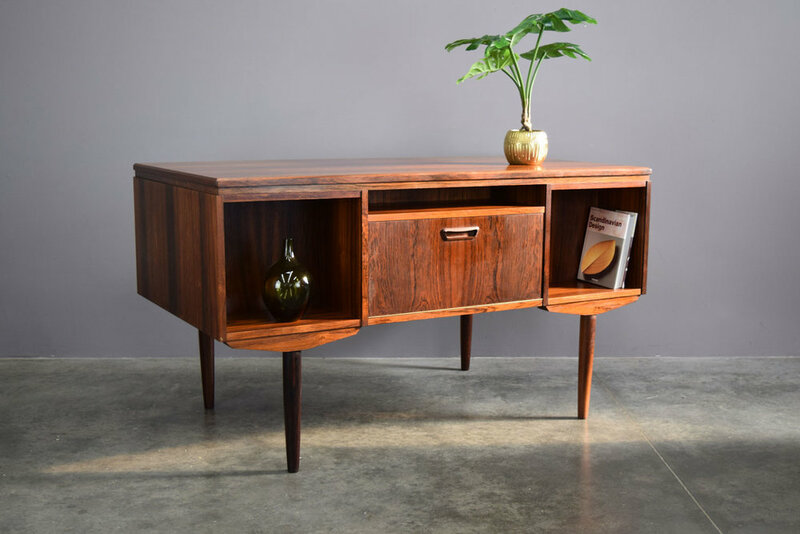 Vintage Modern Maine presents a curated collection of Mid Century Modern and Danish modern furniture, art and housewares. A husband and wife team who have been collecting since the mid 1990’s, we rescue pieces of beautiful vintage design and present them for your enjoyment. Maine sales tax (5.5%) applies to all local sales. Prices listed include a cash (or local check) discount. We are happy to accept credit cards: please add 2.9%. We show furniture by appointment only. We are happy to help arrange for shipping or delivery. Please see our Frequently Asked Questions page or contact us with any questions!